The word “challenge” in the event title was quite apt for me as I’ve put on half a stone since Christmas and the furthest I’d ridden in training was a mere 38 miles. Riding up and down hills for more than a 100 miles was certainly going to be a challenge. There are 16 named hills on the route but probably about three times as many that were just as tough but remained anonymous. The first challenge was to get out of the car as it was raining quite hard and then for the first two hours of the ride. This probably made it slightly easier though as there was certainly no chance of heat exhaustion setting in. Even so I still got through six 750ml bottles of various types of liquid; two of electrolyte, replaced by two of energy juice at the first rest stop (32 miles) and at the second stop (72 miles) two of water as there was no energy drink left. With 60 miles covered all was going well. 50 miles had ticked by in a time of just 3.46 so a sub 8 hour time was on the cards. Yeah, right! The second 50 took 4.29 of riding time excluding rest stops; apart from the official ones there were about 8 others getting rid of cramp. What happened? No sign of fatigue and no problem with the hills which were tough but ride-able but then came a bad patch. It lasted for about 4 hours and ended when I reached the top of the Cat and Fiddle. This coincided with about 8 miles of mainly downhill to the finish as I got my second wind. 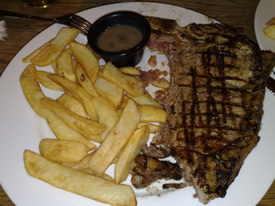 I was dreaming of steak and chips but had been doing so for a few hours by then. The second bad patch occurred at the finish but only lasted for about a minute. I couldn’t swing my legs high enough to get off the bike so had to lay it down and shuffle off. Will I do it again and what will I do differently? Of course I will. I loved it, although I’ll be taking a bag of chips with me. Alternatively, a few packets of electrolyte powder to mix with the water to fight the cramp away. Official start to finish time: 9 hrs 26 and just for a change I wasn’t the last finisher! !